Medxtractor Disruptor 16 - FREE Shipping! Applicability: process up to 30lbs/month (60lbs rosin chips). ++ Shipping Notes: Shipping typically ranges between $250 and $500 (depending on which extractor is purchased and where it is being shipped to). After your order is paid we will send you the Operating Manual and the crating & shipping cost. If within 48 hours of receipt of these items you decide you don’t want to proceed we will immediately refund 100% of your money. When CO2 rapidly decompresses during collection, significant heat is required to keep the CO2 from freezing into dry ice. Using the base configuration of the 2oz and 5 oz collectors (i.e. without the collector heater) this is usually accomplished by setting the collector in a small, water-filled metal container that sits on a hot plate. 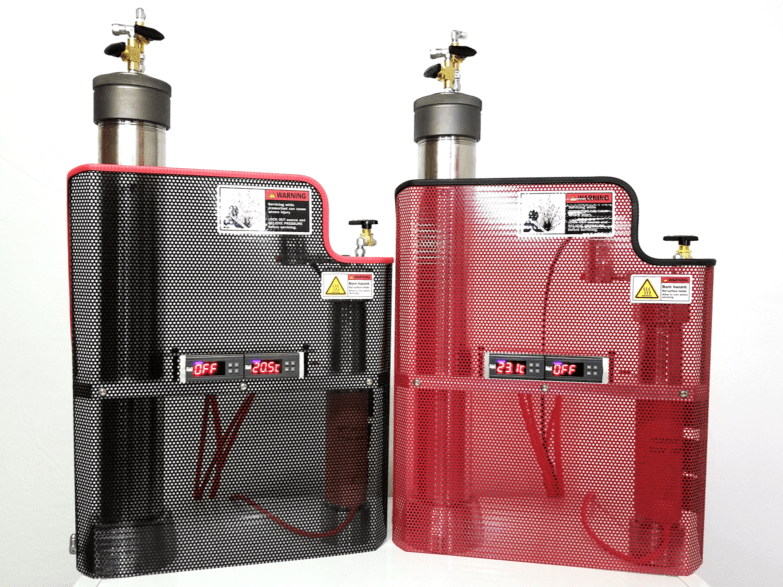 Using the digitally-controlled heater simplifies the heat transfer and eliminates the water pot and hot plate. If you do not have this option, you will have to manually manipulate the decompression valve during decompression/collection. This means that it will either take much longer to decompress/collect or you will have to be present all through the process – this will be hours. Auto-flush allows to to set the decompression timing and then leave. You only have to attend when CO2 tanks are being changed and/or when you collect the extract. This is a huge benefit. directly connect the Supply Tank to the Recapture tank to balance the system. These valves save CO2 and time by allowing tanks swaps, CO2 transfers and top-ups without having to decompress the system.